Image of the Aperture-matched pyramidal horn. The horn is one of the simplest and most widely used microwave antennas. It is a commonly used to feed reflector antennas but also finds application as a standard for calibration and gain measurements. One problem with conventional horns is that edge diffractions from the aperture may cause considerable ripple in the E-plane radiation pattern [Burnside, W. D.]. 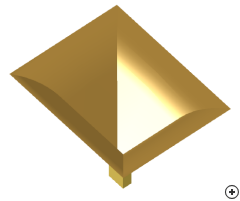 The corrugated horn reduces edge diffractions by reducing the incident field on the aperture edges. This works very well but may present manufacturing difficulties. The aperture-matched horn discussed here reduces edge diffractions from the aperture edge itself, by rounding the edges of the aperture. One problem with this approach is that the horn may become significantly larger, especially for the low-gain cases. However, even a fairly small amount of rounding can significantly improve the ripple in the E-plane radiation pattern and reduce the reflection coefficient.